A featured snippet is the best answer to a question-oriented query, pulled from web content and showcased above ranked search results. Google's featured snippets seek to provide the most useful answer to a given search, as assembled by Google. The result is displayed in an "answer box" at the top of the page. If there are ads for the searched phrase, the adverts will appear before the answer. Here is a featured snippet for "How to create a Youtube channel." Notice that under the featured answer to the query are other questions people ask about the topic. These related queries return a unique set of results that Google deems most effective in answering the specific query. Knowing what other questions people are asking can help you determine what query is best suited for your content and as you think about how to structure your answer to earn a Featured Snippet. More on this later. What are multi-faceted featured snippets? Multi-faceted featured snippets display more than one answer to a query presumed to have multiple interpretations. 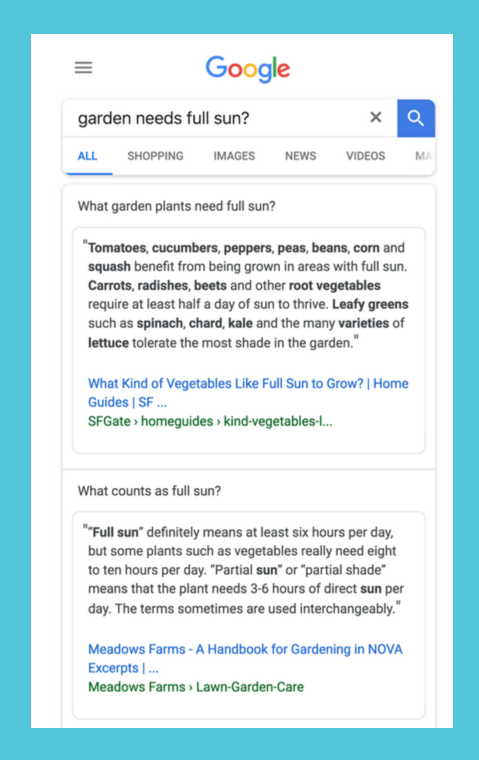 Multifaceted snippets seek to deliver a more complete and insightful set of search results for queries where a different question might be being asked altogether. As of this writing, Google just announced that they are showing more than one featured snippet for "queries that have several potential intentions or purposes". There is more to come on this front as Google hits the ground running with natural language processing as it prepares for voice-powered devices. Knowledge and discovery are evolving with advancements in technology, which means websites must be structured data feeds. 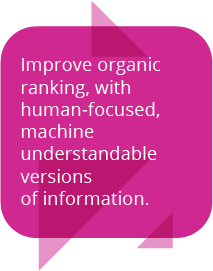 The trend toward semantic SEO and structured data is of greater importance than the snippet itself. The Featured Snippet is a reflection of the shifting search environment. For instance, Google recently launched video featured snippets. 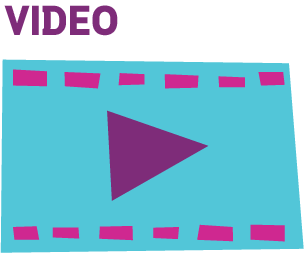 Now, users can get to relevant video content instantly. Says Danny Sullivan, Google search liason, video featured snippets "jump you directly to the right place in a video". Let's face it - personalized information, contextual results, mobile searches, and video mean that structured data and semantic SEO strategies have an increasing impact on search engine results. Do I have to rank first to get featured? No. Your website content may appear in Google's Answer Box even if you do not have top search rank! Because the answer is displayed ahead of the top ten results, it is referred to as zero rank. 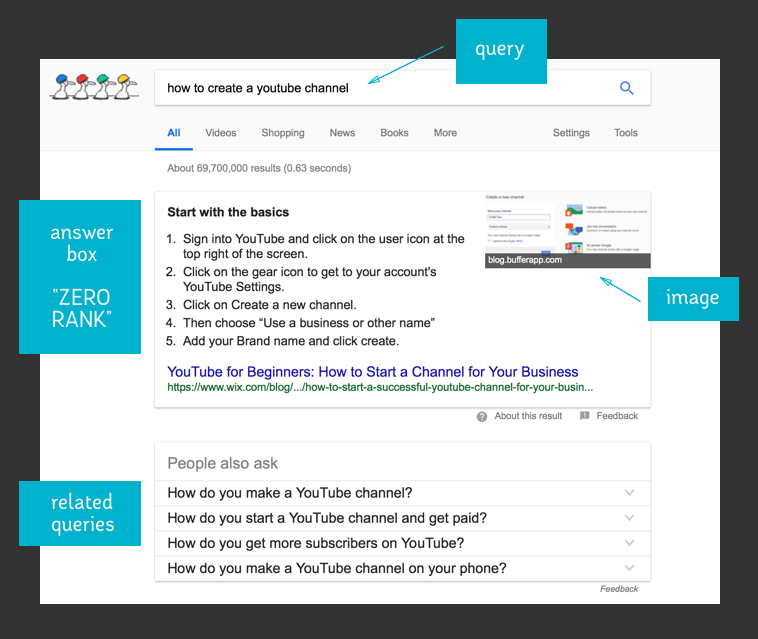 In the example, "How to create a Youtube channel", Wix gained zero rank by being featured above the top ranked domain, though it ranked second in SERP. As far as Google is concerned, their website copy best answers the "how" question in the search query. Move over number one...here comes "zero". 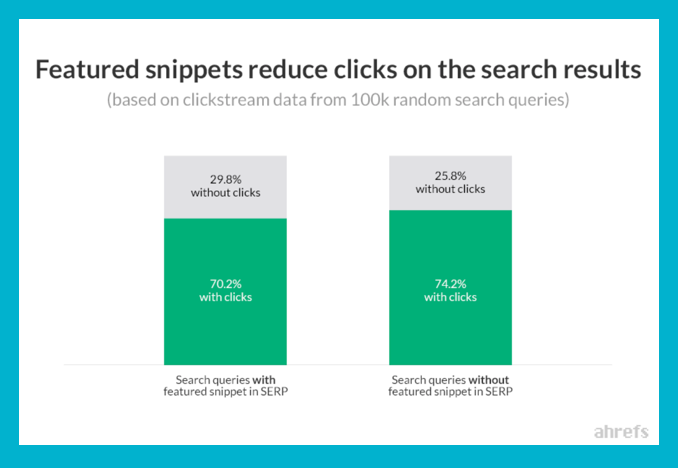 Keep in mind that while you may leap to top position through a featured snippet, research performed by Ahrefs of over 2 million snippets reveals that most instance of a featured snippet is from firms in the top ten. Sooo. "How do I get featured",you might ask? Create the most helpful insights using highly-relevant content around popular questions within your space. There is no button you can press to activate a featured snippet. Google is in control of whose content is used to answer a users query. To get a Featured Snippet on Google, you will have to focus on writing content that answers questions. Format: Find featured snippets where the answer is not in the ideal format ( paragraph, table, list) and improve it. Or follow a correct format. Mobile-Friendly: According to SEMRush the average Mobile Friendly Score for featured Snippets is 95/100. Google tends to prefer information that matches the consensus and other trusted sites. If your answers contravene top research, your content is unlikely to be featured. And remember, if there are people asking questions, your content has to be answering them. If an answer is a factoid, it will be shown as Knowledge Graph. As such, your question should require a more detailed explanation. The format of the snippet that displays depends on the nature of the question asked and how the answer is provided. The featured answer that comes in the paragraph form is the most common. Generally speaking, answers of 40-60 words in length are ideal. • Place the answer directly below the heading and enclosed in <p> paragraph tags. • Use <h1> or <h2> tags for the question. • Stay consistent throughout your articles with the structure. 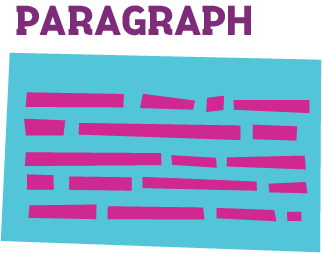 • Paragraphs are used to answer the following types of questions: ( How to do/get…Who is…Why is…What is…). The list can be in numbered or bullet point list format. A featured snippet example in list form would be step-by-step guides like food recipes. 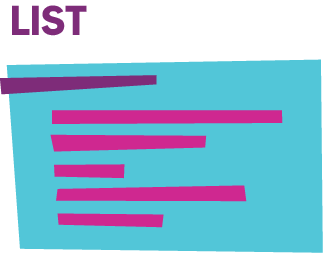 • Place the list directly below the heading and include a primer phrase, such as here are. • Use <ol> or <ul> and <li> tags for the list items. • A featured list normally has between 4-8 items and up to 60 words per item. • Use longer lists whenever possible, so Google is forced to truncate the results and the user has a reason to click through to your site. • How-questions,often show the results in list format. Table snippets make up about 1/4 of all snippets. • Google pulls specific information a user is looking for and displays table results, even recreating its own table, extracting only the exact data related to the query. • A featured snippet will display an answer in the form of a table in search results for pricing, rates, and data. • You can improve your likelihood o clickthroughs by having more than four rows to your table, The table, however, is not optimal for voice search. The featured answer that comes in the video format is the newest format. • Video snippets feature an answer to the searcher’s query with a link to a YouTube video. • Place the answer to the question your video answers in the video description, near the start of the description, and keep it brief. 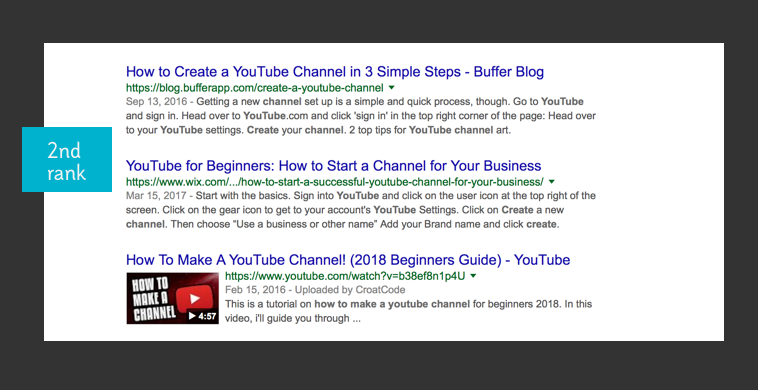 • Google pulls Featured Snippets in paragraph format from the descriptions of YouTube videos. The surge in mobile and digital-assistant initiated queries means that optimizing for voice search is a top priority of marketers. Voice search is disrupting SERP, which means that marketers need to be prepared for change as search optimizes for voice. Concise, answer-oriented information, such as Featured Snippets are well-suited to voice search. Featured Snippets serve as a "central data source for Google Home to provide answers to questions posed to it". Source: The Complete Guide to Features Snippet - Upwork. Though it may not completely eradicate screen-based searches, it will change the way users interact with content and the way search engines crawl, index, and retrieve website information. The best way to stay relevant in the eyes of your customers is to create useful content that helps them solve problems. Ways to prepare for voice-enabled search is to think about how a questions are posed via voice versus type and conform content accordingly. 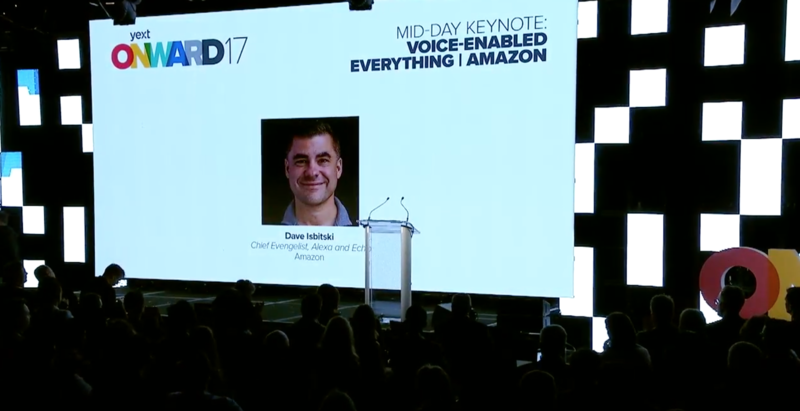 Dave Isbitski, Chief Evangelist for Alexa and Echo at Amazon talks about how important it is to speak spontaneously and naturally. He believes that voice represents the next disruption in computing. Essentially he suggests that marketers should phrase answers in a conversational tone. This brings us back to the basics, which is user-driven information and conversational user interfaces. 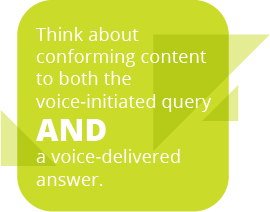 Think about conforming content to both the voice-initiated query AND the voice-delivered answer. 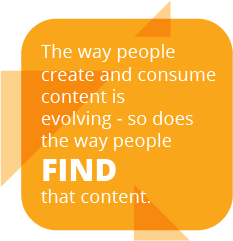 Content can no longer merely revolve around selected keywords - it has to delve deep into answering a user's question, conversationally. As search evolves, it is more important than ever to connect with your audience. Keywords won’t answer a customers questions or figure out what problems to solve. If your copy isn't aligned with problems people are trying to address, you’re just going to build a powerful keyword system, but fail to connect with your audience. User-value drives results and is established by providing clear answers. If the value of an offering is opaque, user utility and trust will be diminished. Authority is gained through multi-disciplinary marketing methodologies, those which appeal both to human judgement and to algorithmic formulates. How to track featured snippets? The right tools will help you keep track of your featured snippets and find opportunities to win them. 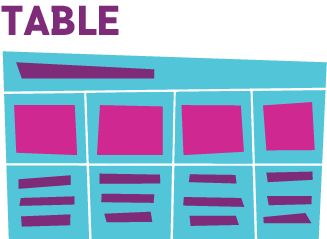 So you’ve been working hard writing detailed content to answer a variety of user queries. But how do you go about tracking your keywords for featured snippets? The SEMrush Position Tracking Tool includes a function where you can monitor keywords that have the potential to become featured snippets. These tracking tools are important in the planning process, as you can readily see your rank to that of the domain with the Featured Snippet. If Google tends to favor specific ranking positions when displaying a Featured Snippet in reference to your own keywords. Tools that allow you to compare your rank to that of the domain that currently appears within the Featured Snippet. 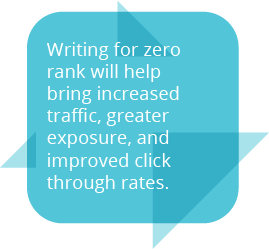 A zero rank brings increased exposure from being featured and generates more traffic to your website. Being featured provides sought-after exposure that brands work hard to achieve. Developing a meaningful strategy for Featured Snippet ranking is a key part of SEO. • Traffic: As your answer is recommended by Google, users are more inclined to click on the link to your website. • CTR: Being positioned at the top of the search results gives your site the added advantage of gaining more clicks. • Exposure: You don’t have to rank number one to appear in the featured snippets. So you don’t have to push SEO efforts as hard as you would to hit the pole position. : Having your content appear in the featured snippets is pretty much having Google vouch for your credibility. That is a big deal! Brands and their marketing teams are having to sit down and strategize new plans to make sure their organic traffic numbers and conversion rates don’t plummet. It can prove to be a very different kind of challenge when a brand has already invested a great deal in their current SEO campaign. However, you don’t have to start banging your head against the wall. A multi-disciplinary approach to digital marketing can help keep you in front of your audience. Simply writing for zero rank by focusing content on the problems that people are trying to solve will help your brand stand out in the minds of clients. An understanding of digital marketing practices can help you connect with your audience and gain rank at the same time. Enjoy the content journey! We do.